WE ARE CURRENTLY RECRUITING PARTICIPANTS! 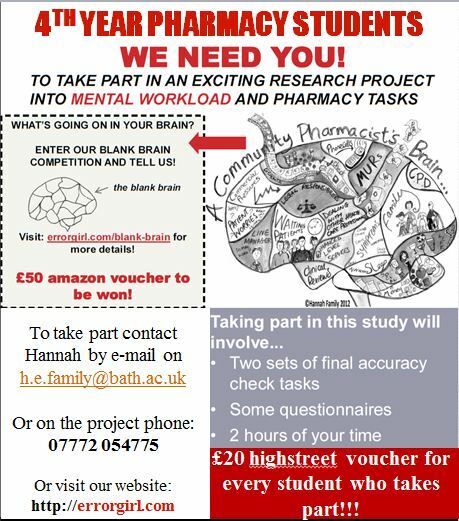 The aim of this study is to study the amount of mental workload pharmacy students experience when they carry out routine community pharmacy tasks. Why it is important to study the mental workload pharmacists experience? The workload of community pharmacists is continually growing. This is due to several factors including the new and expanded roles that pharmacists are taking on in addition to their traditional roles, ever increasing numbers of prescriptions being dispensed and the increasingly competitive business environment that community pharmacies are part of. All these factors impact on the mental workload a community pharmacist experiences as they carry out their day to day tasks at work. The mental workload of a task can be thought of as the demands a task you are working on makes of your brain’s information processing system. It is important to understand and explore the levels of mental workload pharmacists experience because it has been related to both staff and patient outcomes. Why are pharmacy students being asked to take part? As people become more experienced at a task they will the level of mental workload involved in that task for them will change. By involving pharmacy students in this study we can find out how practice and experience of routine pharmacy tasks affects the levels of mental workload experienced when carrying out these tasks. It is also important because this difference between levels of mental workload experienced by novice and experienced pharmacists when carrying out routine tasks also means that the situations that cause problematic levels of mental workload will vary according to experience at the task. What do I need to do if I would like to take part? If you would like to know more about what taking part in this study involves please read this Participant Information Sheet or use the contact form (see the contact page ) to get in touch with me (Hannah Family – Researcher on this project). PLEASE NOTE: We are currently only recruiting 4th year Master of Pharmacy students at the Univeristy of Bath (UK). If you have read the information sheet and would like to take part in this study please get in touch with me (Hannah Family) using the details on the contact form (see the contact page) or the form at the end of the information sheet and I will respond ASAP. You may also have seen this recruitment poster around the Department of Pharmacy and Pharmacology (it is for this study). This is a simplified version of my diary which tells you when I am free to meet you to run the study over the next few weeks. I don’t need much notice – just 10 minutes (just in case I am grabbing some lunch or at the other end of campus). If you want to take part at short notice – I need you to contact me to let me know. I have sent an e-mail around all the students letting you know about this, but if you no longer have that information send me a quick e-mail and I will get back to you straight away.